Members of the Clan Currie from around the world gathered on the Scottish island of South Uist to attend an important symposium on the history and literary heritage of the MacMhuirich Bardic dynasty as part of a weekend of celebrations dedicated to Scotland’s greatest bardic dynasty, the Clan MacMhuirich or Clan Currie. The weekend also included a welcome reception at the Kildonan Museum, a ceilidh on the neighboring island of Benbecula featuring top talent, and the dedication of a new memorial cairn at Stilligarry, home to the MacMhuirich bards for hundreds of years. The MacMhuirich symposium, held in the centenary year of the passing of famed Gaelic folklorist, Alexander Carmichael (1832-1912), was held in the village of ìochdar, South Uist. Clan Currie Society president Robert Currie commented, "How appropriate it was to host our Symposium in the village of ìochdar, as it was here in this village that Carmichael first met Janet Currie in 1865, (still known by her Gaelic name, Seonaid Nic Muirich) who shared stories of the Clan Mhuirich and island life." The symposium was chaired by the Rev. Dr. David Currie, Chaplain of the Clan Currie Society joined by a blue ribbon panel of speakers, featuring Prof. Willie Gillies (retired) from Edinburgh University, Dr. Michael Newton of St. Francis Xavier University, Dr. Alan Titley (retired) of the University College Cork, and Western Isles Council Archaeologist Deborah Anderson and Uist and Benbecula historian Angus MacMillan. Dr. Currie commented, “This was an especially well-chosen panel of speakers. 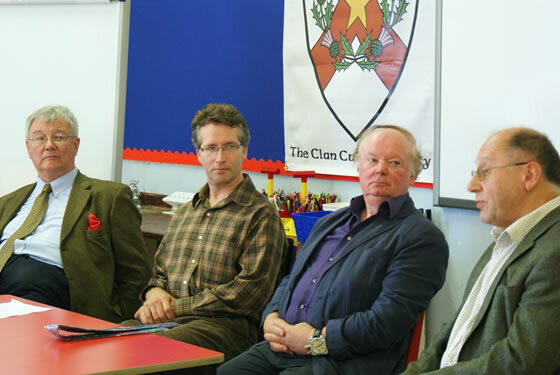 With their combined areas of expertise, the entire history of the Clan MacMhuirich was represented, starting with Prof. The last presentation of the conference came in the form of a field trip to the village of Stilligarry and the medieval ruins at Baile name Bàrd (Township of the Bard) as it is known in Scots Gaelic. Council Archaeologist Deborah Anderson led attendees through the findings of a test trench dug within the foundation of the site which as she reported was clearly the home of an important family given its sheer size versus similar homes of the period. Robert Currie also outlined plans for a future expanded excavation of the site to learn more about life in the Outer Hebrides and particularly this impressive home which may have also served in the capacity of a bardic school. Stilligarry was the home of the Clann Mhuirich, Hereditary Bards to the MacDonalds of Clanranald for over 300 years. It was from this site in South Uist that multiple generations of MacMhuirich bards penned the Gaelic literary masterpiece, the Red Book of Clanranald. Later that evening, a clan dinner was held at the Dark Island Hotel in Benbecula followed by a sold out ceilidh which featured outstanding community talent led by Gaelic Mod winners Paul McCallum and Niall Campbell and singer Catriona Garbutt. Also performing were champion piper Angus MacKenzie, fiddlers Simon Bradley and Anna Wendy Stevenson, the Eriskay Dancers and the Sgoil Lionacleit singers who performed a 17th century MacMhuirich poem set to music. BBC Radio broadcaster and Clan Currie member Morag (nee Currie) MacDonald served as Mistress of Ceremonies. Proceeds from the evening benefitted Clan Currie and the Ceòlas Summer Music School. On Sunday afternoon, members of clan and community gathered together at Stilligarry for the dedication of the new memorial cairn (monument) in honor of the MacMhuirich bards. A unique feature of the cairn is a collection of stones submitted by clansfolk from the four corners of the globe representing the clan's far-flung sons and daughters and the Scottish Diaspora. Stones came from as far away as New Zealand and South Africa. The cairn, shrouded under a bolt of Currie tartan was officially unveiled by Robert Currie and Stilligarry crofter Alasdair MacDonald. Piper Angus MacKenzie performed a new pipe tune, “The Clan Currie,” commissioned by the Society especially for the occasion and composed by renowned piper and Gaelic historian Iain MacDonald. The cairn was made possible through generous donations from members of the worldwide Clan Currie. Additional donations will be accepted through the end of October to help the Society reach their fundraising goals for the project. All donors will be listed on a scroll to be presented to the Kildonan Museum in South Uist. They will also receive a special commemorative item from the dedication ceremony. Alasdair Allan, Regional MSP attended the Symposium, ceilidh and cairn dedication. “I was pleased to have been invited to attend a series of events, organized by the Clan Currie Society to commemorate the MacMhuirich bards who lived and worked on those islands for centuries. The event concluded with Robert Currie announcing the destination for the 2013 Symposium – Nova Scotia, Canada. 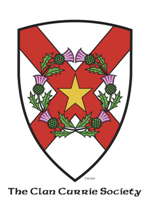 The Clan Currie Society wishes to acknowledge the incredible and steadfast support received from so many local friends and partners, including Stòras Uibhst, crofter Alasdair MacDinald, the Ceòlas Music School, QinetiQ, the Kildonan Museum, the Liniclate Youth Pipe Band, mason Neil Macpherson, the Western Isles Council and Alasdair Allan, MSP. 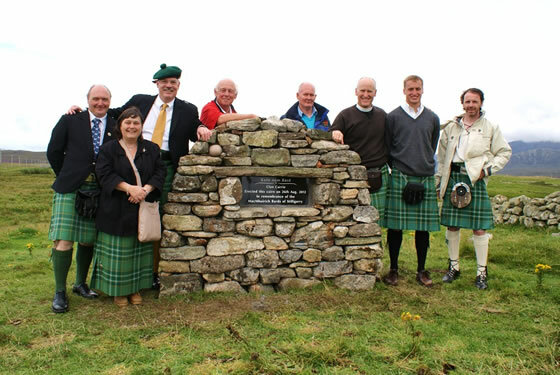 Clan Currie Cairn – Members of the Clan Currie from the US, Canada and Scotland gather around the new MacMhuirich memorial cairn in South Uist. 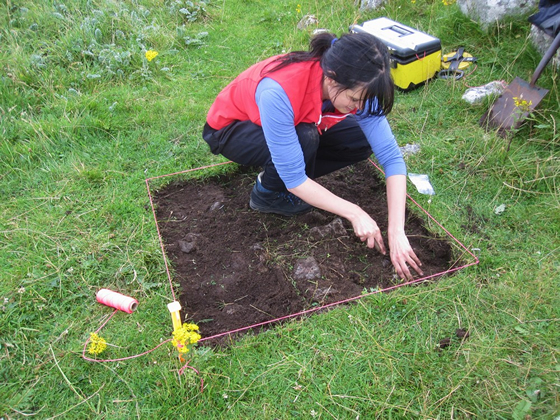 Archaeologist Deborah Anderson – Western Isles Council Archaeologist digs a test trench at the medieval Bard’s home at Stilligarry in South Uist. Plans are underway for a more thorough excavation in the future. MacMhuirich Symposium Panel – TheMacMhuirich Symposium concluded with a panel discussion featuring (left – to – right) Angus MacMillan, Dr. Michael Newton, Professor Alan Titley and Professor Willie Gillies.